Mommy's Kitchen - Recipes From my Texas Kitchen: Janet's Chocolate Chip Coffee Cake for National Coffee Cake Day! Janet's Chocolate Chip Coffee Cake for National Coffee Cake Day! A delicious and moist sour cream coffee cake that has chocolate chips in the middle and scattered on top with a crispy cinnamon-sugar topping. Today is National Coffee Cake Day! Although it's a delicious holiday, I just wanted an excuse to make this beautiful coffee cake. I saw this recipe years back in a Rachel Ray Magazine and I've been dying to make it. What caught my eye about this particular coffee cake recipe was that it was a chocolate chip coffee cake. The official name for this recipe is Janet's Chocolate Chip Coffee Cake. It stated in the magazine that this was a old family recipe, and those are my favorite ones. Janet mentions that her mother used to make this cake all the time when she was growing up back in the late 70's and early 80's. Janet and her father used to hover around the table just waiting for this coffee cake to pop out of the oven. I thought to myself this had to be good. And good it was, actually great!!! The flavor and texture were wonderfully soft and the cinnamon and the chocolate chips compliment each other deliciously. This Coffee Cake is definitely a keeper in our house. These are the ingredients you will need:all purpose flour, baking soda, baking powder, butter, salt, sugar cinnamon, sour cream, chocolate chips, 2 eggs and vanilla extract. Oops I forgot you will also need one special helper. I'm sure the cake just wouldn't be the same without him. preheat oven to 350 Grease a 8 inch square baking pan. In a medium bowl mix together the flour, baking powder, soda and salt.In a small bowl combine 1/4 cup sugar and 1 tsp cinnamon set aside. Using a electric mix beat together the remaining 1 cup sugar and butter until fluffy. Beat in the eggs one at a time, then beat in the sour cream and vanilla extract. Fold in the flour mixture in two parts until just combined. Pour half the batter into the cake pan and sprinkle with half of the cinnamon sugar mixture, then half of the chocolate chips. Spoon the remaining batter as evenly as possible over the filling. Spread gently and evenly. Sprinkle with the remaining cinnamon mixture and chocolate chips. Bake about 30 - 35 minutes or until golden brown and toothpick inserted comes out clean. Preheat oven to 350 Grease a 8 x 8 inch square baking pan or 8-9 inch spring form pan. If you feel like there is to much batter you can use a bigger baking pan. In a medium bowl mix together the flour, baking powder, soda and salt. In a small bowl combine 1/4 cup sugar and 1 tsp cinnamon set aside. Using a electric mix beat together the remaining 1 cup sugar and butter until fluffy. Beat in the eggs one at a time, then beat in the sour cream and vanilla. Fold in the flour mixture in two parts until just combined. Pour half the batter into the cake pan and sprinkle with half of the cinnamon sugar mixture and half of the chocolate chips. Spoon the remaining batter as evenly as possible over the filling. Spread gently and evenly. Sprinkle with the remaining cinnamon mixture and chocolate chips. Bake until golden brown and a toothpick inserted comes out clean 30 - 35 minutes. 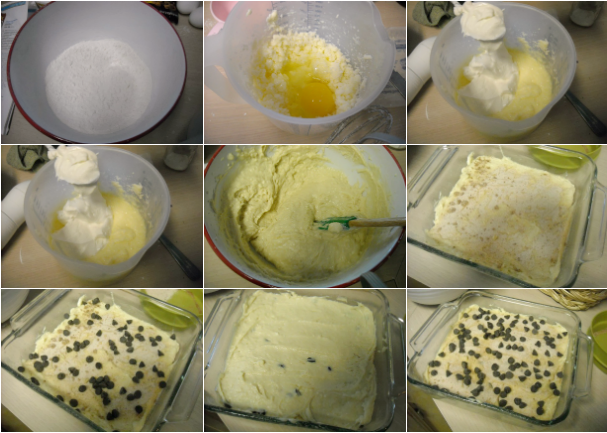 Baking time varies when using a 8 x 8 inch baking pan sometimes the middle can take a bit longer to bake. I love recipes that are simple, but have outstanding flavor. This recipe certainly looks like it would fall into that catagory. I've never eaten a coffee cake before. Do you think this cake would pack well in a lunch box? Heidi those are my favorite kinds of recipes. As a matter of fact Carson took a piece in his lunch box today for school. Of course we called it chocolate chip cake, the coffee part blows it for him. Well I guess if you rate it in the "YOU GOTTA TRY THIS RECIPE NOW CATEGORY!!!" I'm definitely gonna have to!!! Looks really yummy! I also loved that American food holidays site too - I've never seen that before! I love that particular category of recipes myself!!!!! And it really does look great. Wish I had a slice right now with my coffee. Oh wow, that looks so delicious! 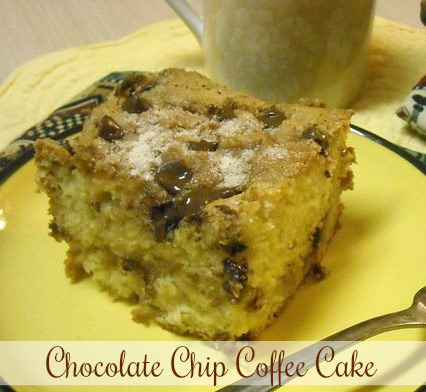 I love coffee cake, but it's even better with chocolate chips! I swear I gain 10 pounds every time I look at your site! Looks delicious. My kids would LOVE this! If I had some sour cream in the fridge I would make it tomorrow. I'd say any day is a good day for chocolate!! Found your blog yesterday and made your coffee cake last night. I used succant for the base sugar but splurged w/white sugar for the cinn/sugar mix. I also swapped greek plain yogurt for the sour cream and did a 1/2 wheat and 1/2 white flour mix. Husband still loved your coffee cake and took another piece to work today. Thanks for a great blog. Allison you probably didnt do anything wrong. I bet you just didnt cook it long enough, sometimes the middle is a stickler. The last time I baked it I had to bake it longer becasue i kept sticking a toothpick in the center and kept getting some batter. I just lower the heat some and keep baking. If it gets to brown cover with some foil. Thanks! Will try it again maybe next week to take to my family reunion. For what it's worth, the outside of it is delicious!! lol;) I love that it's a sweet treat but just sweet enough for an after lunch snack. Just what I was looking for in the taste dept. You can even add the batter to a larger baking pan if you like. That might work better for you. I have made this coffee cake twice now, and it's so delicious. There are several more recipes that I will be making. Thank you! Instructions here says to use 8 inch square pan, but when I use the print recipe to print it, it says to use 9 x8 inch or 9 x 13 inch baking pan. Which is correct? Hello, I have followed your bog for a while and have produced some gorgeous cakes following your repcipes. @Tony, A Coffee Cake is not a coffee cake because it has coffee added. Coffee cake refers to any sweet single layer cake enjoyed along side a cup of coffee.